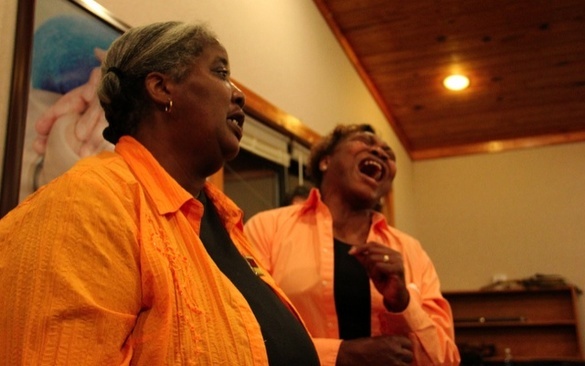 China Pettway is one of Gee's Bends leading gospel singers and one of the few locals who after attending college returned to live in the community. China was taught by her mother, Leola, how to quilt at the young age of eleven. "We had to quilt until 10 at night. Then, she would let us stop and get to bed. That was every evening except Saturday and Sunday. I made my first quilt, it was a 'Star.' And I still have it. Now a home health worker, China enjoys working with the elderly. "I love my patients and I think they are the most sweet and beautiful people you can meet." Singing is China's hobby. Mary Ann Pettway is currently the manager of The Gee's Bend Quilting Collective. She made her first quilt for the collective in the summer of 2005. The seventh of 12 children, Mary Ann was born and raised in Gee's Bend. She has one married daughter and two grandsons. After graduating high school in 1975, Mary Ann took college book keeping and accounting classes before working in a sewing factory for 20 years. Mary Ann is one of the leading singers of the Pleasant Grove Missionary Baptist Church and became involved with quilting after hearing about the trips the quilter of the community went on. "Before I started back to quilting, I was with my friend Sabrina's grandmother Arlonzia a lot and heard about these trips they would go on to other cities through The Quilts of Gee's Bend traveling exhibition. So I told her, 'I'm tired of hearing how good of a time y'all are having. I want to start having a good time too.' So she told me, 'Well, then start quilting!" And she is, thankfully, still quilting today. Space is available in March 2020! Gray Center invites you to join us for our 3rd annual quilting retreat with China Pettway and Mary Ann Pettway of the Gee's Bend Quilting Collective. These ladies will share their unique quilting styles as participants explore the work of their hands and the spirituality of quilting. We look forward to welcoming you to this special weekend.